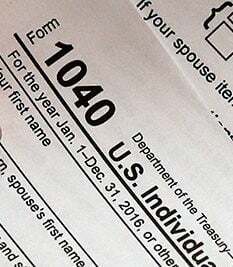 PHOENIX — Arizona taxpayers who are ready to start filing their state returns are in a sort of legal and financial limbo because of a fight over income taxes between Gov. Doug Ducey and Republican lawmakers. The tax forms printed and being sent out by the Arizona Department of Revenue presume that lawmakers eventually will cave in to Ducey and adopt changes he wants in state tax law. That would mean the deductions allowed on those forms would be the same as those now permitted on U.S. forms under a law signed by President Trump in late 2017. But Ducey has been unable to get his fellow Republicans, who control the state House and Senate, to agree. In fact, he vetoed an alternate plan last week offered by GOP lawmakers. The bottom line is that what’s in the tax forms Arizonans are getting — the Ducey plan — does not match current state law. And that means taxpayers have to decide whether to follow the law the way it actually is or the way Ducey wants it to be. For example, the new federal law limits to $10,000 the amount of taxes paid to state and local governments that can be deducted from an individual’s federal taxable income. What lawmakers approved last week would have conformed state law to those federal changes. That’s what Ducey wants. But it also would have cut income tax rates by 0.11of a percentage point to offset any additional taxes owed due to new limits on deductions. Ducey found that part unacceptable and vetoed the whole bill, leaving Arizona tax law — and allowable deductions — unaltered. Put simply, the state tax code still says that Arizonans can deduct all the taxes they pay to other state and local governments. Tax attorney Bob Kamman said that creates problems for those ready to file. Even assuming lawmakers do conform — with or without the offset with lower income tax rates that Ducey finds unacceptable — such a law might not take effect until this summer. Ed Greenberg, spokesman for the Arizona Department of Revenue, said it doesn’t matter what the law is on the day the return was filed. The agency is presuming that any changes eventually made would be retroactive. That means the taxpayer would have to go back and file an amended return — and pay any additional taxes due. But Greenberg said taxpayers who choose to follow the law as it is on the books, versus the Ducey-wished version, will be on their own. That’s because the state form won’t tell them what is deductible. What that means, he said, is taxpayers will have to research all the changes in federal law, figure out which changes apply, and make adjustments for those changes on the state return. On Monday, Ducey made it clear he is waiting for lawmakers to blink on the issue. He said he does not plan to present any counter-offer after vetoing the legislation Friday. A clearly angry Gov. Doug Ducey lashed out at lawmakers from his own Republican Party.